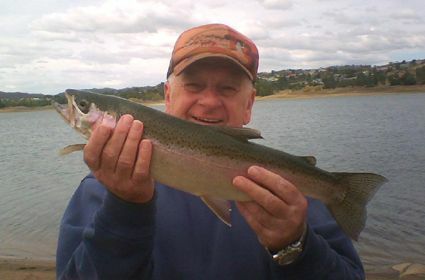 Headlines: Fishing has been very good this past week with fantastic conditioned rainbows out of Lake Eucumbene. Bait, Troll and Fly are all producing fish and the coming Easter weekend should see some brilliant fishing for all anglers. The entrance to Brookwood and Rushy Plains bay has a rock that is just starting to show. It is 100 metres or so from shore so please be careful in this area. Rivers:- Continue to be worth a look in the daytime for some fun dry fly fishing. The fishing during the daytime will be good with small dry flies like hoppers and stimulators being a good option along with emerger style patterns during the evening. As the temperatures get progressivly colder hatches will occur in the warmest part of the day and this can be grea for dry fly angling. Good numbers of hoppers have still been active on the higher streams. Stream fish have been a little small in some areas. There is still the chance of better fish but first light and last light would be the times to find better sized fish on the move. Best streams to look at are the Euc, Thredbo and Murrumbidgee. 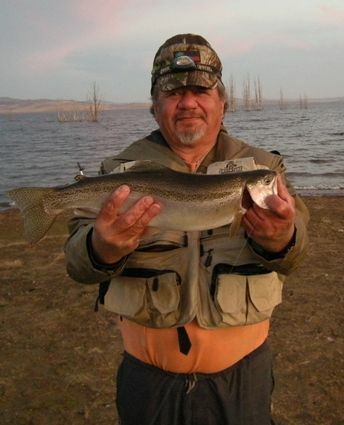 Lake Eucumbene:- The lake had fished very well though mudeye hatches have not been as big. Fish were still coming in around the edges on the weekend and some cracking rainbows amongst them. The lower end of Crowe's round through to Seven Gates have been very good areas, but Old Adaminaby and Anglers Reach have been producing some reasonable numbers. 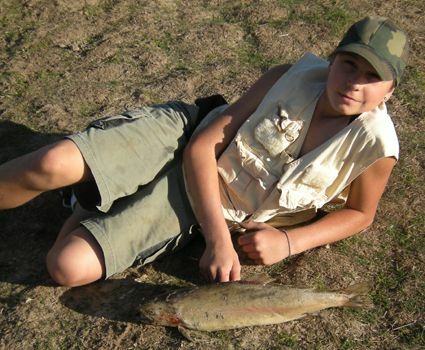 Fish have been onto them most of the time and there are some great quality fish to be found. There have been a few, not many but a few rainbows pushing 2kg. Most of the fish are averaging 800gm - 1kg and are in excellent condition. Any of the standard streamers will work at present. Evening fishing with Muddlers and Mudeye patterns are generally the best. Beadhead nymphs have been a good searching pattern in deeper water during the day. The last two weeks we have had numerous reports of anglers getting broken off on the strike or very soon after. Eight to ten pound tippet has been a far better option than fishing lighter at the present time. Even had a unlucky angler lose his whole flyline on a fish this week! Just following up from my report last week. Decided to head back up to Lake Eucumbene for a Saturday afternoon fish after my success last week. The wind was up a little too much when I first arrived about 2:30pm at Seven Gates for fly fishing so I decided to throw out a powerbait and settled down to read the newspaper while I waited to the wind to abate. About an hour and a half later the rod bent over with a very healthy rainbow about 45cms eventually coming to the bank always nice to get the first one in the esky. The wind dropped off to a nice little breeze, just enough to ripple the surface, it was now about 6:30 -7:00pm and perfect to throw a fly around. Decided on an unweighted double nymph rig and started casting. After about 30mins I saw a swirl only 4 meters from where I was standing thigh deep in the water. Ripped my line back in and flopped it in the hit zone, two seconds later I was on to a fish that almost had me to the backing in seconds truly unreal. 48cms of strong, healthy rainbow finally in the net after long tussle on 6lb tippet. Got another rainbow which was very acrobatic and decided to call it quits after that. Actually had a fish rise between me and the bank at one stage, there seemed to be fish all over the place. Lake Jindabyne:- Jindabyne has been good with some great rainbows around the edge on evenings. There have been several Evenings have been the best with some olive and black woolly buggers being the best pattern. Best areas are Rushes Bay, Hatchery, Kalkite and Creel Bay. Tassies on lead core line have been a great method on the lake. It has been a case of ten different anglers, ten different "best" colours in these lures. Popular choices have been Y94, Y82, 55, 67, 50, 44, 96, 89 and bloody ripper. Small tan and black crickhoppers and CD 3 Rapalas in rainbow trout have been working well on flat lines. *Johnny 'scrubworm' Pene has showed he is not just a bread and butter bait angler over the last few nights. He has been cleaning up casting flies behind a bubble float and slowly retrieving it in on his spin gear. Last session he got three cracker rainbows of 900gm, 1 kg, and 1.15kg. These were gilled and gutted weights. Best flies have been Mrs Simpsons and Craigs Nightimes. A method well worth trying at present. Just a quick report for you to pop up about a few days Dad and I (along with brother James and nephew Steven) had at Tantangara and Jindabyne. Tantangara was a bit erratic, loads of small Rainbows around for one session but the next was devoid of life. We managed 7 Rainbows all up but none were of any appreciable size but young Steven managed his first ever Rainbow on a Vibrax. Other fish were caught on Bead Head Nymphs or Powerbait. Dad and I then spent a couple of days at Creel Bay in Jindabyne and found the fishing to be very good, especially in the middle of the day. A further 8 Rainbows were landed all being solid, or more accurately should have been solid. All of them were well out of condition looking like post spawn fish, one went 46cm and should have been over a 1kg but only weighed 800g! 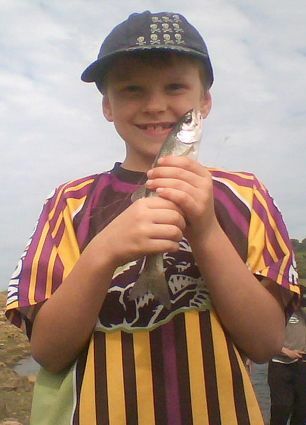 All were caught on Powerbait (various colours) but we could not tempt a Trout to hit either a lure or fly? and Dad with one of the Jindy bows. 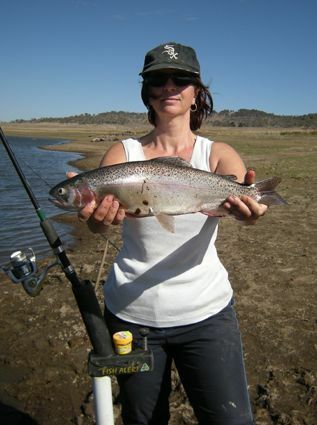 *First time trout angler from Cooma, Tanja Beckmann had a great time on the weekend while fishing at Buckenderra. In an afternoon she ended up with five quality rainbows before 5.30! Lemon twist Powerbait was the bait used. Photo compliments of Johnny Scrubworm. 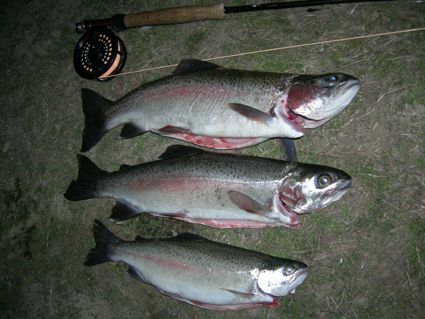 *Mick Fabro and Matty Fabro fished Buckenderra area on the weekend. Matty got 2 rainbows and a very nice brown. Mick got a really nice fish on a fly behind a bubble.